Never before have we so desired a Korean hatchback. 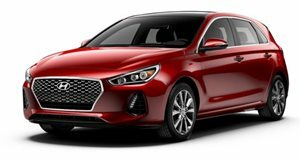 From the moment the new Hyundai i30 was teased, it was apparent that Hyundai potentially had a rather handsome hatchback on its hands. For sure, a lot of the larger features (namely the front grill) did look rather Audi-ish, but the basic shape did appear to be quite attractive. Now, though, we've got our first look at the new i30 hatchback in full - and, while styling is obviously subjective, we really hope Hyundai USA decides to import this new five-door over as the next Elantra GT. In quite a few ways, the Hyundai i30 could work rather well as the Elantra hatch in the States. Those smart exterior looks are matched by an equally classy interior that's also rather spacious - which is helped out by the i30 being a little bit wider and longer than the car it replaces. Those with a penchant for fun behind the wheel will also be very pleased to know that Hyundai's worked hard making the new i30 more precise and dynamic than its predecessor, with claims of faster steering racks, larger brakes and multi-link rear suspension (fitted across all models, no less) allegedly helping to make the new i30 more entertaining and predictable to drive than the old one. And that's even before the hot hatch i30 N makes its debut sometime in 2017. Other noteworthy features are also included in the new Hyundai i30. Safety gear is aplenty, with the more noteworthy highlights being the autonomous emergency braking and the rear-facing monitoring system that warns the driver of hazards when reversing out of a bay, and the range of engines is suitably diverse - with the new 1.4-liter turbocharged gasoline unit being perhaps the highlight of the lot (though, if the i30 does make it into the States as an Elantra, the 140-hp output might need to be bumped up slightly to suit our market's demands). Give it a bit more oomph, however, and - assuming the production car's as good in the real world as it is on the spec sheet - the Hyundai i30 could be an exceptionally good family hatchback.